Measurements: 16.1 cm L x 18.3 cm W x 8 cm HThe second tin has the same measurements but is slightly less high - 6.1 cm. Back (Smaller Tin): World's Navy Plug Smoking Tobacco Rock City Tobacco Co. Ltd. Factory - 6 Quebec Port 13 - D Large Plug 3 x 3 Gross Weigh 3 lbs 8 1/2 oz Tare 8 1/2 oz Net 3 lbs. Back (Larger Tin): World's Navy Plug Smoking Tobacco Rock City Tobacco Co. (1936) Limited Quebec Large Plug 3 x 3 Gross Weigh 3 lbs 9 3/4 oz Tare 9 3/4 oz Net 3 lbs. Narrative: Rock City Tobacco was founded in 1899 in Québec City, Québec. In their early years, they specialized in making pipe tobacco, snuff, and chewing tobacco. In 1936, Carreras Ltd. of London, England bought a 70 per cent. share of the company, making Rock City its Canadian subsidiary. Rock City kept its own identity, and was able to manufacture Carreras' brands in Canada, such as Black Cat, Craven "A", and Turf. Other brands made by them in this period included Corvette and Sportsman, among others. In 1958, Rock City's parent company was merged with Rothmans of Pall Mall in the United Kingdom. This led in 1960 to Rock City becoming acquired by Rothmans' Canadian subsidiary, which had just recently established itself in Canada. The deal was completed in 1963 when Rothmans of Pall Mall Canada finished buying the remaining outstanding shares of Rock City. Today, Rock City's Québec City plant is still being used by Rothmans, Benson & Hedges, as Rothmans of Pall Mall Canada is known today, and its name is still in use as a subsidiary, most notably on the Number Seven brand. 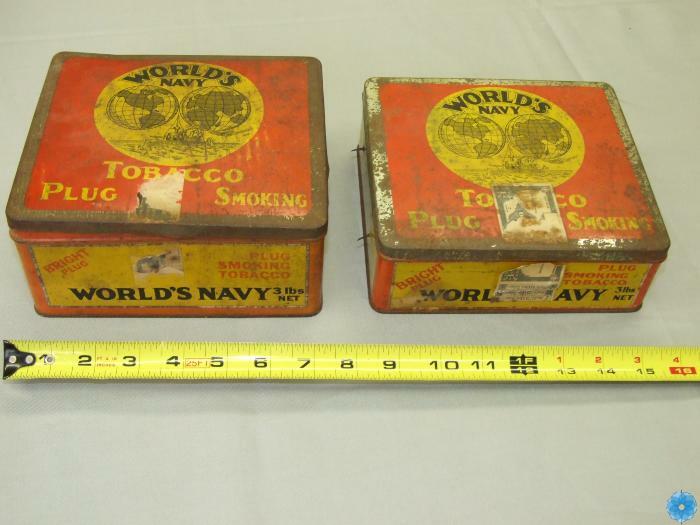 Description: Two square tobacco tins labeled World's Navy Plug Smoking Tobacco. The tin lids are red, with a large yellow circle oriented to the top-centre of each lid. Within the circle are two pictures of the earth, one showing North and South America, and the other showing Europe, Asia and Africa. Above the earth pictures is the brand, World's Navy, and below is the picture of a ship at sea. See Markings section for text. There is a damaged rectangular label on the front of each tin, likely used as a way to indicate the tins were unopened upon purchase. History of Use: These objects are tobacco tins from Rock City Tobacco Company in Quebec. There are visual matches to this tin online, and information about the company was obtained from images that showed advertising on sides of the tin that are not recorded in the database. This new information has been used in the research of the objects, though the information on the other sides of the tins has not been added to the Markings field, since it has not been verified on the objects. From online searches, it has been determined that the brand is called “World’s Navy Plug Smoking Tobacco, produced by the Rock City Tobacco Company of Quebec. Collectors estimate this tin to originate from 1930-1939. This information has been confirmed by two collectors sources, though not a historical resource. Rock City Tobacco Company was founded in 1899; in 1936 it sold 70% of its shares to Carreras Ltd. in London England, though still produced its own brands. By 1960, it had merged with Rothmans of Pall Mall, another London company, at which time Rock City’s original brands were discontinued. “Navy Plug” refers to the manufacturing process surrounding the tobacco. This is a unique term that hails from its nautical roots, where sailors would wrap the tobacco in rope or a canvas tube and sometimes add flavourings. The tobacco would be tightly compressed within the canvas or rope, producing a dense roll of tobacco. Next steps for this object would be to first confirm the information on the object itself that is not available on the database. If this information corresponds to the information researched above, then further action can be taken in order to further enrich the History of Use field in the database. Information such as how these tins came to Nova Scotia, if they were used purely for tobacco storage, and brand popularity could be further researched. It would also be useful if the date could be confirmed on the tobacco tin from another source.